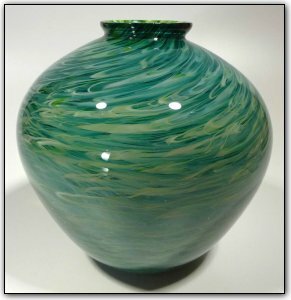 This bowl features many shades of greens and blues swirling throughout creating a stunningly mesmerizing effect. The artist also added a thin layer of white in between the inner and outer layers of color making the colors just about jump off the glass. Make sure to zoom in to see just how deep and luscious the colors are, and the way they interact with each other. Absolutely beautiful!